My daughter was watching a Curious George marathon on PBS today. They were running the "monkey marathon" to celebrate President's day and I'm not sure if 6 episodes back-to-back of a meddlesome monkey named George was a political statement or not, but that's a topic of another post at another time. This post is about the episode where George was blowing bubbles one cold winter day only to look down and see one of his friends "pop" the bubble which actually caused it to shatter. Apparently the bubble got so cold that it froze. Living in south Texas, I've never heard of such a thing and almost dismissed it as cartoon silliness when I decided to e-mail one of the world's leading authorities on bubbles. Yes, I have some pretty interesting people in my list of acquaintances. So the guy I contacted is Geoff Akins of www.BubbleJuggler.com. 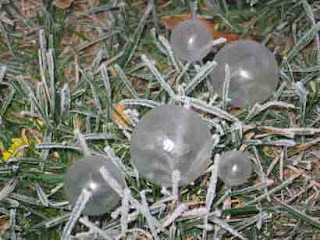 He not only verified that bubbles CAN freeze, he even sent me a picture of a few that he was able to capture on film. I'm sharing them with you now. By the way, Geoff will be visiting Texas next fall. If you are interested in getting a totally unique, educationally significant school or library program from a world renowned "bubbleologist", and NOT have to pay his travel from Chicago, contact me ASAP as we are setting up a tour now. He'll only be here one week (September 24-28, 2007) so act fast or you miss out! Romance novels account for 40% of the sales of popular fiction. That's a fairly interesting fact in itself. But then a study in press at the Journal of Research in Personality showed that those who read fiction scored higher on tests of empathy and social acumen than readers of non-fiction. As I guy who reads about 100 books each year, almost all of which are non-fiction, this study bothered me when I first read it. Raymond Mar (a Ph.D. candidate in psychology at the University of Toronto) says "Stories often force us to empathize with characters who are quite different from us, and this ability could help us better understand the many kinds of people we come across in the real world." In fact, Mar suggests that the correlation between reading fiction and being more empathetic and having better social acumen is causal. That is, that reading fiction actually INCREASES our ability to understand others and to get along better socially. There is a great book on the subject called "Why We Read Fiction" by Lisa Zunshine. Jackie Stanley wrote "Reading to Heal" about the topic of bibliotherapy. And Victor Nell penned "Lost in a Book" about the psychological and even physical benefits of reading fiction. But I won't read ANY of these books because I've made a commitment to read more fiction and all these books are non-fiction. I'm starting the new year with "The Kite Runner" by Khaled Hosseini. I resisted the urge to read non-fiction and forced myself to browse new sections of my local Barnes and Nobles. I am a non-fiction junkie and it has been difficult for me to break my habit and indulge in reading something PURELY for pleasure. But I felt that I really NEED to do this in order to keep my social awareness in shape. Until my new social acumen picks up though, I wonder if I will be less caring and empathetic about my fellow members of society. I wonder what other people might think of me if I seem boorish or somehow anti-social. Will others begin to think of me as some sort of non-fiction reading monster? But then I realized that as a non-fiction reader, I couldn't care less what everyone else thinks. July 21st is the day that bookstores will begin selling "Harry Potter and the Deathly Hallows", book 7 in the Harry Potter series. As a performer with a strong background in presenting magic tricks, I must admit that I like the Harry Potter books and have been at almost every mid-night party the night before the book was allowed to be sold. Most of the time I went as a paid performer, dressed like a wizard doing magic tricks for all the other Harry Potter lunatics who have to be the FIRST ones to get their hands on the book. I'm sure this year will be no different. I even have a web page just for promoting the new Harry Potter Book 7. Check it out, if you want. By the way, the picture at the left is of me performing at Rice University for the children of the alumni before their homecoming game. I always enjoy performing for the Rice University Alumni.